In the last lesson, Lesson 48, we looked at some of the key features of Vedic Sanskrit, like Sandhis, Infinitives etc. In this lesson we will analyse the first hymn from the Rig Veda. This is a hymn to Agni. Agni, meaning fire, and a deity representing fire, represents in addition to the fire itself, lustre, brilliance, the sun, lightning, intellect etc. Agni is addressed in over 200 hymns and is second only to Indra (who is addressed in over a quarter of the hymns of the Rig Veda) in importance in the Rig Veda. The metre of this hymn is Gāyatrī. This consists of three octosyllabic verses identical in construction. When normal, each of these verses ends (the last four syllables) in ~ – ~ ~/-. hótāraṃ ratnadhā́tamam ॥ 1 होता॑रं रत्न॒धात॑मम् ॥ The hotar, lavishest of wealth. agníḥ pū́rvebhir ŕ̥ṣibhir ī́ḍyo nū́tanair utá । अ॒ग्निः पूर्वे॑भि॒र् ऋषि॑भि॒र् ईड्यो॒ नूत॑नैर् उ॒त । Worthy is Agni to be praised by living as by ancient seers. sá devā́m̐ éhá vakṣati ॥ 2 स दे॒वाँ एह व॑क्षति ॥ He shall bring hitherward the Gods. yaśásaṃ vīrávattamam ॥ 3 य॒शसं॑ वी॒रव॑त्तमम् ॥ Most rich in heroes, glorious. sá íd devéṣu gachati ॥ 4 || स इद् दे॒वेषु॑ गछति ॥ Verily goeth to the Gods. devó devébhir ā́ gamat ॥ 5 दे॒वो दे॒वेभि॒र् आ ग॑मत् ॥ The God, come hither with the Gods. távét tát satyám aṅgiraḥ ॥ 6 तवेत् तत् स॒त्यम् अ॑ङ्गिरः ॥ That, Angiras, is indeed thy truth. várdhamānaṃ své dáme ॥ 8 वर्ध॑मानं॒ स्वे दमे॑ ॥ Increasing in thine own abode. sácasvā naḥ svastáye ॥ 9 सच॑स्वा नः स्व॒स्तये॑ ॥ Agni, be with us for our weal. puróhitam पु॒रोहि॑तम् Accusative singular of masculine adjective puróhita “priest”. From purás + past passive participle of √dhā “put”. Literally “put in front” (of fire). Karmadhāraya compound. devám दे॒वम् Accusative singular of masculine devá ” heavenly, god”. Maybe from the noun “dív” (sky). hótāram होता॑रम् Accusative singular of masculine hótr̥ “priest, chief priest”. From √hu (“sacrifice”) or √hū (“invoke”). ratnadhā́tamam र॒त्न॒धात॑मम् Accusative singular of masculine adjective ratnadhā́tama. Superlative of ratnadhā́ = rátna (“treasure, blessing”) + dhā́ (“bestowing, granting”). rátna is from √rā (“give”); dhā́ is from √dhā (“put”). Tatpuruṣa compound. I praise Agni, the (domestic) priest, the divine sacrificer, the giver of the best treasures. agníḥ अ॒ग्निः Nominative singular of masculine agní. ā́ आ Note how the the preposition / verbal prefix is separated from the verb. [In classical Sanskrit it would have been āvakṣati.] Note also that this preposition is accented as we mentioned before in lesson 46. Agni has been praised by former and current seers. He will bring the gods here. rayím र॒यिम् Accusative singular of masculine rayí “wealth, treasure”. From √rā (“bestow”) through “ri”. Through Agni one will obtain wealth and prosperity day by day. And (obtain) (the state of) honour and most heroic sons. 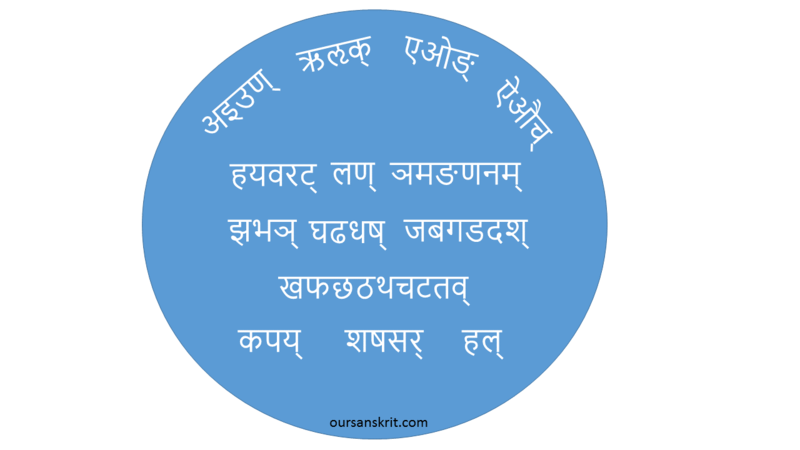 viśvátaḥ वि॒श्वतः॑ adverb “from all sides”. víśva (“all”) + tas. Note the shift of the accent of víśva to the last syllable before the suffix “tas”. ási असि॑ Present indicative second person singular of √as “be”. Note that the verb is accented because it is in a subordinate clause. sáḥ स: Nominative singular of masculine pronoun tád. “that”. Connected to the relative yám above. O Agni, that devotion and sacrifice that you surround on all sides, that same goes to the gods. hótā होता॑ Nominative singular of masculine hótr̥ “priest, chief priest”. From √hu (“sacrifice”) or √hū (“invoke”). deváḥ दे॒वः Nominative singular of masculine devá “god”. Maybe from the noun “dív” (sky). devébhiḥ दे॒वेभिः॑ Instrumental plural of masculine devá “with the gods”. Maybe from the noun “dív” (sky). The instrumental can be used without a preposition like “saha” and can mean “with”. ā́ आ Preposition / verbal prefix to be used with gamat. The god, Agni, the chief priest, the true, and of the most excellent fame, will come with the gods. aṅgiraḥ अ॒ङ्गि॒रः॒ Vocative singular of masculine aṅgiras. “messenger, Agni”. O Agni, Angiras, just what good you would do for the worshipper, that is exactly true. tvā त्वा॒ Accusative singular (the enclitic form) of second person personal pronoun yuṣmad. “you”. The enclitic form does never has an accent. agne अ॒ग्ने॒ Vocative singular of masculine agní. imasi इ॒म॒सि॒ Present indicative active first person plural of √i (‘go”) : ā + √i = “come”. Note that in classical Sanskrit the ending is always “mas” (so imaḥ) but, in Vedic Sanskrit, the “masi” ending is much more common than the “mas” ending. O Agni, illuminer of darkness, we come to you, day by day, bearing homage in our thoughts. své स्वे To be read as two syllables su-é. Locative singular of pronoun adjective svá “own” (it refers to all three persons and numbers “your own, my own, our own, their own etc.). (To you) the ruler of sacrifices, the shining protector of order, growing in your own house (growing in the altar after being kindled). naḥ नः॒ Dative plural (enclitic) of first person personal pronoun “asmad”. “to us”. Unaccented. sūnáve सू॒नवे॑ Dative singular of masculine sūnú “to his son”. In the verse, sūnávé has two accents because the accent of the elided “a” of ágne gets thrown backward. ágne अग्ने॑ Vocative singular of masculine agní. sácasva सच॑स्व Present imperative middle second person singular of √sac “accompany”. The ending “a” of sácasva is metrically lengthened to sácasvā. naḥ नः॒ Accuative plural (enclitic) of first person personal pronoun “asmad”. “us”. Unaccented. So, O Agni, be of easy access to us like a father to his son. Be with us for our well-being. This is the end of Lesson 49. In this lesson we analysed the first hymn (RV 1.1) of the Rig Veda.